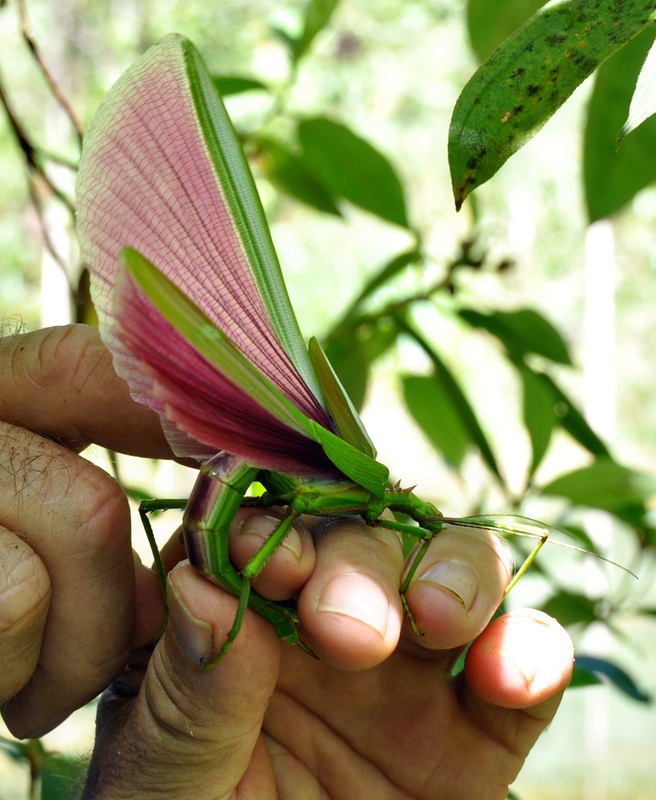 Not real fairies but a strikingly beautiful stick-insect – and if you’ve never considered these insects to be attractive then just look at these photos! And recently we have been lucky enough to see a female on two separate occasions. Neither Allen nor I have observed this species prior to having a copy of the aforementioned book and I’m sure that we would remember. The females are a vivid, glossy green with bright pink/cerise wings – we have not yet seen a male of this species but they also have pink wings and the pink spiny tubercules. Both males and females can fly well; certainly the females we have seen could and they really do look like pink-winged fairies. In order to be able to photograph the wings Allen gently held the insect – she didn’t emit any unpleasant odour which apparently they can do when handled so I don’t think she was too stressed. I just took a couple of quick photos and then he let her go and she took off fast and high into a nearby tree. 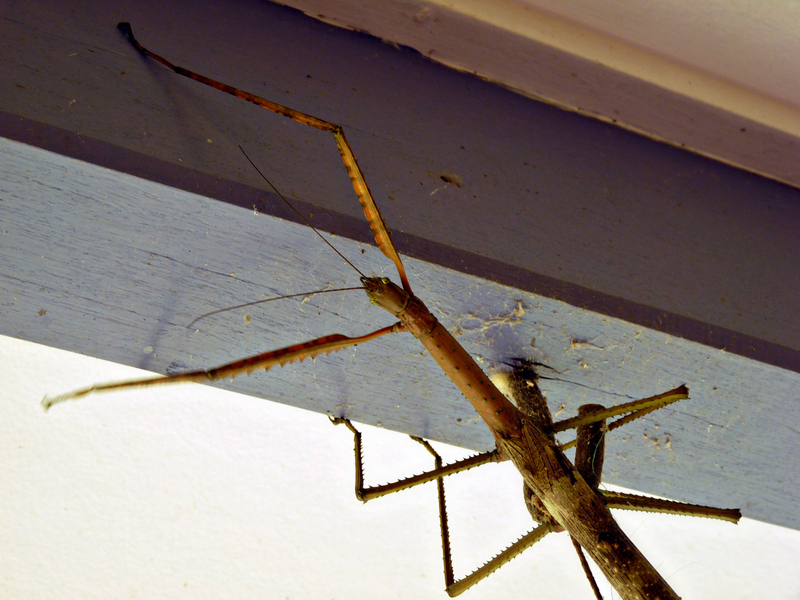 And while I’ve been writing this post yet another species of stick-insect has appeared on the verandah in front of my window. Do they know that we have a new book? Wulfing’s Stick-insect (Acrophylla wuelfingi). Apparently this species is not uncommon in northern Queensland rainforests and we have both seen them before, at Wild Wings & Swampy Things and other locations in Daintree. The body length of the female that is currently resting within my sight is about 200mm – she’s big and looks vulnerable in her current position. We are going to move her this afternoon, well before the Black Butcherbirds cruise the length of the verandah looking for late afternoon snacks. 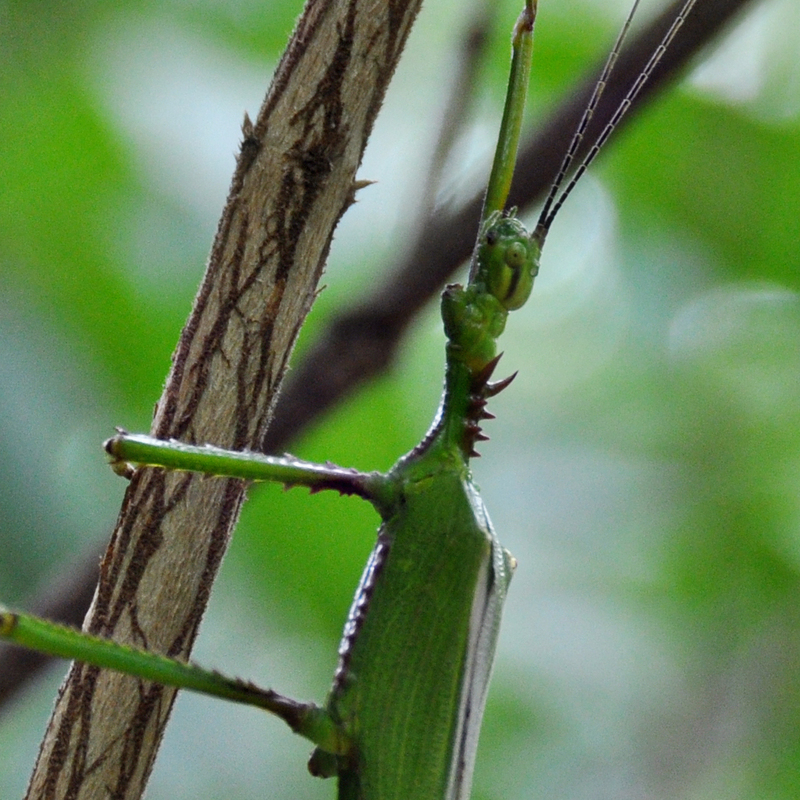 Wulfing’s Stick-insect is closely related to Titan Stick-insect(Acrophylla titan) which is found in coastal areas from SE Queensland down to Victoria. I don’t think you would want either species in great numbers in a garden or orchard as they must consume a fair amount of vegetation to feed a body that size. We are, however, delighted to find several different species living here and it is especially gratifying to be able to identify them as well as to read more about their habits. 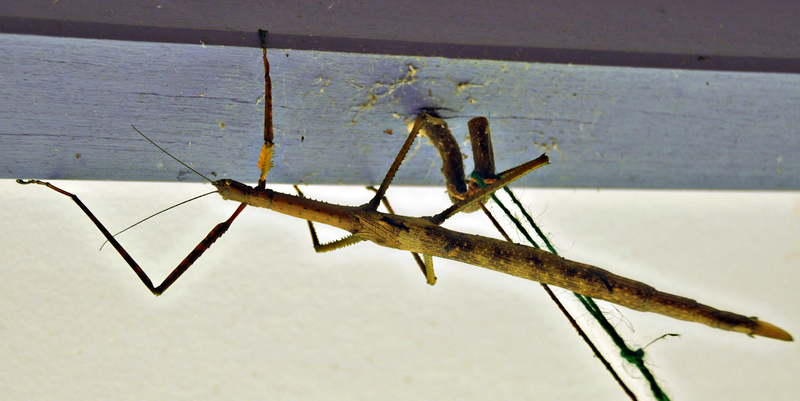 This entry was posted in Stick-insects and tagged Hasenpusch Family Stick-insect (Parapodacanthus hasenpuschorum), Wulfing’s Stick-insect (Acrophylla wuelfingi). Bookmark the permalink. She is gorgeous – what pretty pink wings! And I am glad the local stick insects have taken note of your new reading material. yes it was a truly exciting moment by the ponds – by the way that other ‘unknown’ species I was telling you about is another Wulfings. Jack Hasenpusch has been extremely helpful – the colours of ‘sticks’ as he calls them vary enormously. What a beautiful creature. I have never seen the likes of that colour scheme – green body with pink fluted wings. Lovely. We were on the edge of some pond,s in our gumboots, looking for dragonflies when Allen saw it right in front of him. I was so excited – the green is vibrant and those wings………as you say – lovely. Celia is loving her new lens but understands your comment about the auto focus – it makes a very nice portrait lens too. THe kids in my grade 8 class brought one of these in the other day. They had a good look at it with lots of squeeling as it crawled over them. then suddenly it took flight across the room. The kids all gasped at the gorgeous pink wings and several declaired it looked just like a fairy. One of them caught it again and released it outside onto a bush. They were all in awe. I found one of these in my carport yesterday and had thought it was a grasshopper at first, until I got a closer look, it took until late this afternoon to actually come across your images in google to find out what I actually have! I must say absolutely gorgeous wings, I took photos trying to find someone on Facebook who could identify this “strange looking grasshopper.” I live in NSW Australia near Newcastle, and when I read through your article it made me wonder how it got from it’s habitat in Northern QLD to mid coast NSW. Unfortunately when I picked it up this afternoon it was no longer alive 😦 I was hoping to have someone come out to collect it so it could be in a more natural habitat for it’s species.